Seeing from the evolution of data transmission speed and size of data centers, it is not difficult to find that the pressure on the data centers to manage data quality and transmission speed continues to grow, which leads to the need for faster data transmission over the network. Ethernet industry has laid a path to higher networking speeds like 100GbE, and 25G Ethernet has been developed to provide a simpler path to future Ethernet speeds of 50 Gbps, 100 Gbps and beyond. The release of the 25GbE specification provides cost-effective solution for server-to-switch connectivity. However, network will not stop the pace of development. How far can 25G Ethernet go? This article is going to focus on the question. 25G Ethernet is a standard for Ethernet connectivity in a datacenter environment, developed by IEEE 802.3 task force P802.3by. The IEEE 802.3by standard uses technology defined for 100 Gigabit Ethernet implemented as four 25 Gbps lanes (IEEE 802.3bj). In 2016, 25G Ethernet equipment was available on the market, such as 25G SFP28 transceiver and DAC cable. In addition, 25G Ethernet supports for 100G using QSFP ports that can be converted to 4 lanes of 25 Gbps, like 100G QSFP28 transceiver. Here is a table of 25G Ethernet specification for you. It can offer both CapEx and OpEx savings through backward compatibility, for investment protection and seamless migrations with consistent rack-design and reuse of the existing cabling infrastructure, avoiding costly and complex changes. The technology utilized in 100G to 25G connectivity is similar to that in 40G to 10G connectivity, but the performance is increased by 2.5 times, thus reducing the power and cost per gigabit significantly. 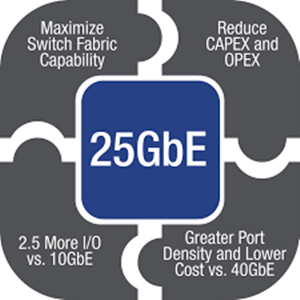 25G Ethernet provides higher port and system density than a comparable 40G solution. Both power savings and higher density results in lower cooling requirements and operational expenditure for data center operators. 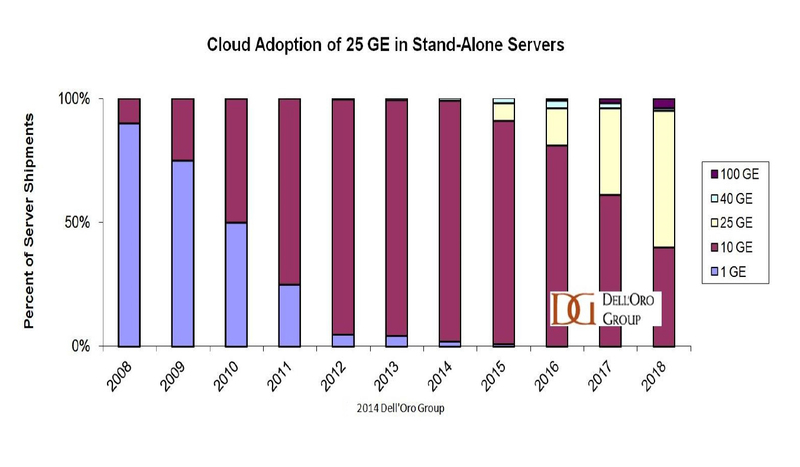 Considering the significant benefits and compelling economics of 25G Ethernet, it is no surprise that the move to 25GbE is accelerating—a recent five-year forecast by industry analysts at the Dell’Oro Group predicts 25G Ethernet will be the dominant Server port speed for new systems by 2018. You can learn about it from the following figure. However, never underestimate the need for industry consensus building. At present, 25GbE is mainly used for switch-to-server applications. If it can realize switch-to-switch application, 25G Ethernet may go further. To be frank, 25G Ethernet indeed gains ground in some aspects compared to 10G and 40G Ethernet. If you plan to deploy 25GbE network, you can visit FS.COM which provides quality 25G SFP28 transceiver and various fiber optic cables. The 25G Ethernet is proposed standard for Ethernet connectivity in a data center environment, developed by IEEE 802.3 task force P802.3by. According to the IEEE standards, 25G Ethernet is now defined for both single-lane and four-lane versions of 25G, such as SFP28 25G transceivers (1×25 Gbps) and QSFP 28 100G transceivers (4×25 Gbps). This article will focus on 25G SFP28 transceiver. The 25G SFP28 transceiver is a high performance module which supports 25G data rate for data communication applications. It has two types: SFP-25G-SR and SFP-25G-LR. The former one is designed to use a nominal wavelength of 850nm and can operate over OM3 fiber up to 70 meters and OM4 fiber up to 100 meters. It is suitable for short-range data communication and interconnect applications. While the latter one features a highly reliable 1310nm DFB transmitter and PIN photo-detector into duplex LC connector, providing links up to 10 kilometers over single mode fiber. It is designed for long-reach applications. Here is a figure of SFP-25G-SR for you. Generally speaking, 25G SFP28 transceiver is usually used for 25G to 100G connectivity. This part will take 25G SFP28 SR transceiver for example. Cabling Solution 1. From the figure below we can see that one 100G QSFP28 transceiver can be connected with four 25G SFP28 transceivers via the MTP LC fanout cable. This is the simplest cabling solution for 25G to 100G connectivity. Cabling Solution 2. We can deploy the MTP/MPO breakout cassette to accomplish the optical link. As the following figure shows, one end of MTP trunk cable is plugged into the MTP/MPO mm connector interface of 100G QSFP28 transceiver, while the other end is plugged into the MTP port at the rear of the MTP/MPO breakout cassette. Then the LC ports in the front of the MTP cassette and four 25G SFP28 transceivers are connected by four duplex LC patch cables. Cabling Solution 3. In addition to deploy MTP modular cassette, we can also use fiber enclosure containing MTP fiber adapter panel. In this way, the cabling can be flexible. Since the fiber enclosure can hold up to four MTP fiber adapter panels, the fiber density can be greatly improved. The cabling solution is shown in the following figure. From the left to the right, the 100G QSFP28 transceiver is connected with MPO adaptor on the MTP fiber adapter panel by MTP trunk cable. The MTP fiber adapter panel will be installed in the fiber enclosure. Then another MTP trunk cable connect the MPO adaptor on both MTP adapter panel and at the rear of the MTP cassette. Finally, the whole 25G to 100G connectivity is completed by the connection between duplex LC ports in the front of the MTP cassette and four 25G SFP28 transceivers, using four duplex LC patch cables. Cabling Solution 4. We can replace the MTP cassette and four duplex LC patch cables with one MTP LC fanout cable. As the following figure shows, the MTP connect interface of the harness cable is plugged into the MPO adaptor on the MTP fiber adapter panel while the other end four duplex LC connector interfaces are plugged into four 25G SFP28 transceivers. By using MTP components, 25G to 100G connectivity can be accomplished with high cost effectiveness. I hope after reading this article, you can have a better understanding of 25G SFP28 transceiver as well as 25G to 100G connectivity.